The world is on track to produce a staggering 1.6 billion tons of steel this year, used to construct everything from cars to skyscrapers. The environmental cost, though, is enormous: together, the iron and steel industries account for 5 percent of the planet’s total carbon emissions, according to a recent study in Science. 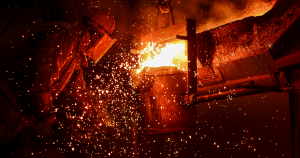 That’s why researchers are racing to find a practical way to produce steel with less waste. On Monday, for instance, the MIT Tech Review reported that a startup called Boston Metal plans to open a steelmaking facility in Massachusetts. Its purpose: to prove that a greener process could clean up the industry. To make the “intermediate metal” that gets turned into steel, metal workers combine iron oxide and a coal derivative called coke. Doing so releases large amounts of carbon dioxide. But Boston Metal, which spun out of MIT, is working on an alternative process called “molten oxide electrolysis” that the company says cuts coal out of the equation. Its inputs are iron ore and electricity — which could be provided by renewables — and its outputs are oxygen and a ferroalloy, a material that is then made into steel. Boston Metal isn’t the only company working to make steelmaking clean. There’s also Tata Steel, an Indian steelmaker that recently demonstrated a technology that still uses coal, but in a more frugal process that it says could cut the process’ carbon dioxide output in half. And the Australian government is working with steelmaking companies to develop a steelmaking technique that relies on charcoal instead of coal, and recaptures the energy in waste heat, which could cut emissions and water use substantially. Civilization is hungry for the trains, ships, cars and skyscrapers that keep it humming along. To arrive at a sustainable future, we’ll need to find a way to make that process green.